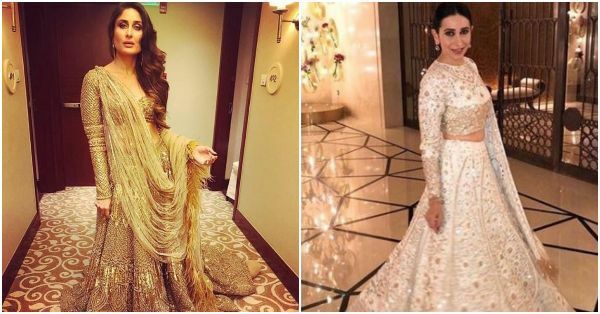 8 Lehengas We Spotted In 2018 That Are Giving Us Major Ethnic Wear Goals! There is something insanely elegant about lehengas. And, we aren’t saying this, our favourite celebrities are. Perhaps, that's why so many of them were seen donning this gorgeous ethnic masterpiece on several occasions in 2018 - at Diwali parties, celebrity weddings, fashion shows, and even award functions. One can't imagine an ethnic closet without lehengas, especially a celebrity closet. So, here are our eight favourite picks from 2018 that we spotted on our beloved celebs from B-town. Check them out and get ready to drool. 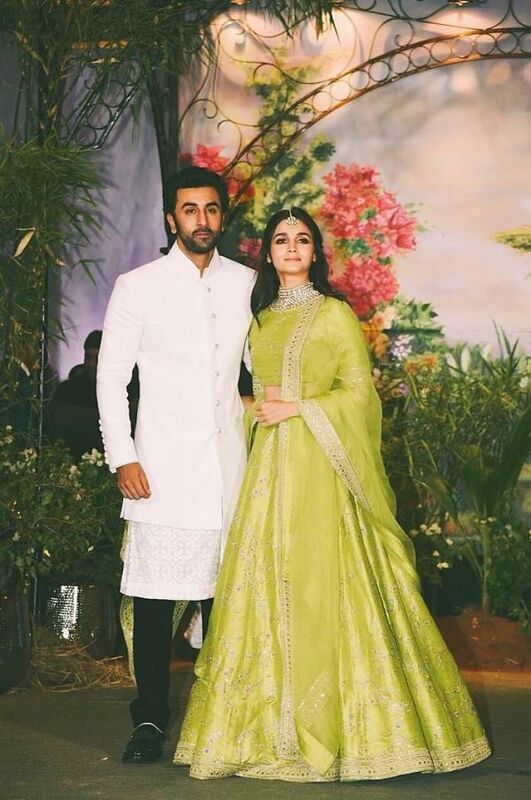 Alia looked like she had stepped 'right out of a fairytale' in a fluorescent green Sabyasachi lehenga at Sonam Kapoor and Anand Ahuja’s wedding reception. The lehenga was hand embroidered with floral motifs in silver thread work and she teamed it with a diaphanous dupatta. 2. This Red And Beige Lehenga Is Pure Love! We loved what Katrina Kaif wore to the wedding reception of Sonam Kapoor. Kat looked surreal in this dreamy red and beige lehenga with bold floral motifs. We're especially crushing over this low-cut blouse that she chose to wear with the Manish Malhotra ensemble. The former Miss World is a radiates light literally everywhere she goes. And, once again, Manushi stunned in a beautiful black sequinned Sabyasachi lehenga as she crowned the new Miss World in China. The swoon-worthy outfit was embellished with hand-cut sequins and even came with a gorgeous, long train. The all-black lehenga is a perfect melange of modern and vintage. The Lust Stories actress had us falling head over heels for her as she walked the ramp in a seafoam Shyamal and Bhumika lehenga at India Couture Week 2018. The voluminous lehenga had floral accents and came with a cropped blouse with sheer, layered sleeves. Need we explain why sea green just became our fave colour? This fully embroidered ivory silk lehenga looks as stunning as its celebrity muse. The lehenga from Payal Singhal’s Saira collection is a representation of Islamic art from the Mughal era. Aditi Rao Hydari, who was the showstopper for the designer at Lakme Fashion Week Summer/Resort 2018 looked like a complete royal, and we love. We recently spotted this black and beige lehenga featuring heavy embellishments in silver and a sheer dupatta with 3D floral work on the ramp. Disha Patani wore the masterpiece while walking for ace designer Tarun Tahiliani, and she looked stunning, to say the least. What we like the most about the outfit are the bejewelled noodle straps on the blouse that add an extra bit of glam to the lehenga. Another shimmery number that caught our attention in 2018 was this all-white high-shine Manish Malhotra lehenga. The piece that featured intricate embroidery and Kashmiri gold thread-work looks regal in every way. The dupatta too had floral applique work on the border - love. Karishma Kapoor was spotted wearing this lehenga at the wedding celebrations of Mohit Marwah and Antara Motiwala earlier this year. This heavily embellished gold lehenga weighs the same amount as a full-grown Labrador Retriever (30 kg to be exact). Yup, no kidding! Designed by Falguni-Shane Peacock, the lehenga has a very Parisian vibe and features a feather-encrusted dupatta. Kudos to Bebo for carrying the lehenga so elegantly, despite the weight. We just died a little after looking at these celebrities wearing these gorgeous lehengas. So, which one is your biggest lehenga crush? Let us know in the comments section.